I love fudge. 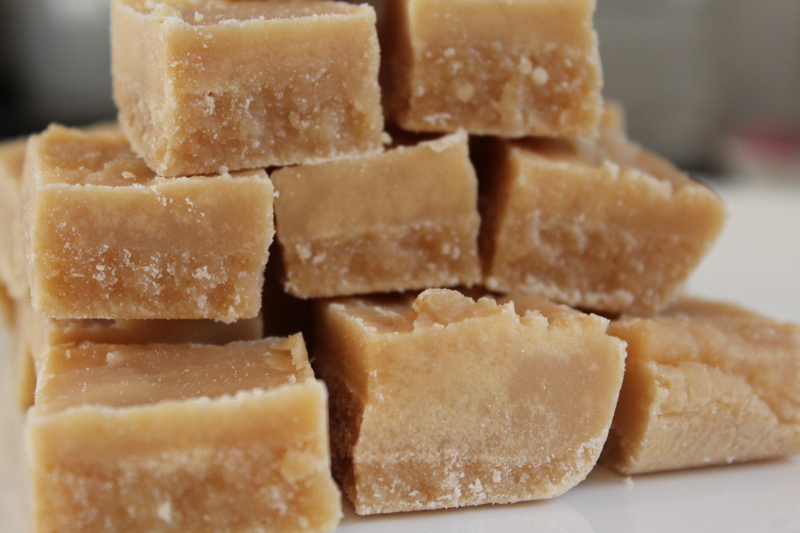 Particularly the grainy, more brittle and buttery type, known as tablet, rather than the softer more creamy type which is known as fudge. 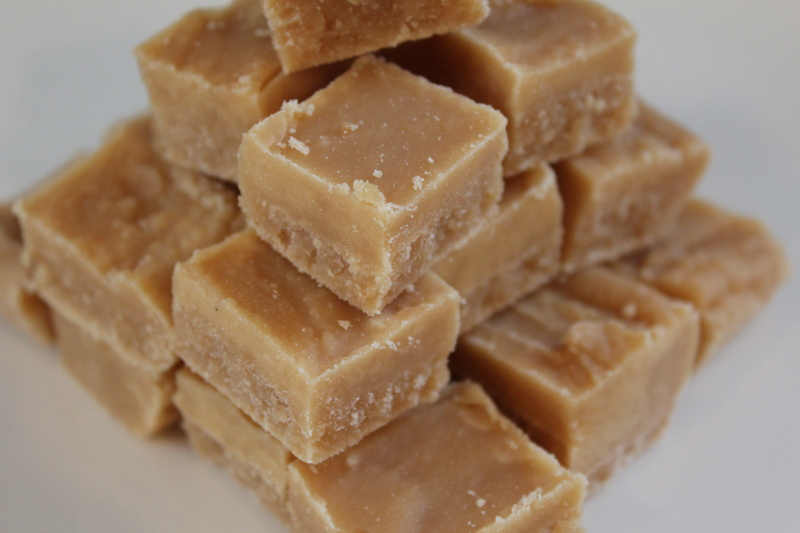 Tablet originated in Scotland (in around 18th century), and whilst I don’t have a separate spot for Scotland it will go under my UK entry, although I may add a few others for N.I., Wales, and England as there are loads of fab recipes for these countries. This particular recipe has a special place in my heart, as I made loads of batches of it for our wedding earlier this year as favours for all the guests. 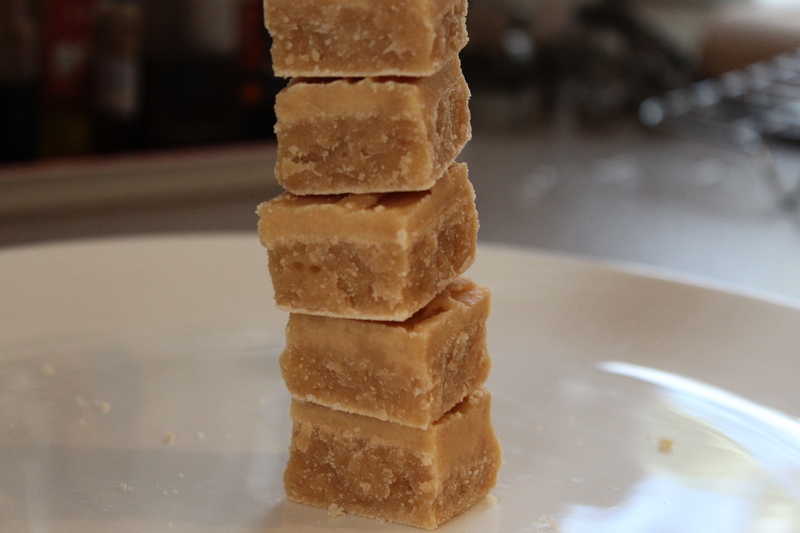 We wanted our wedding to be a bit relaxed and a bit ‘homemade’, so I spent a few days making so much tablet that by the end of it, I didn’t really fancy eating loads of it myself – which is very unlike me. It went down a storm at the wedding, so I made another batch a couple of weeks ago to give people for Christmas (hence not posting it until now). I have to say, I think this is my best batch – maybe I took more time over it, as I think that’s one of the tricks with tablet- it’s making sure you boil/simmer the mixture for long enough to get the more caramel taste, but not too long so that it turns into toffee. It’s also in the mixing afterwards. So far, every time I’ve made it, I’ve mixed it by hand which is hard work, but I figured if I’m going to eat it, I’ve got to earn it. I love the recipe below, it’s worked every time for me, so definitely recommended if you haven’t made it before – it’s a really easy and straightforward recipe to follow. In fact, I love the recipe series on the Guardian website – ‘How to make the perfect…’, which is where this recipe comes from. I’ve made chocolate brownies and sticky toffee pudding from this series which also both came out fantastically well. I love the way Felicity Cloake reviews and tries out loads of different recipes, giving details on the ingredients and then comes up with her own (and better) version – for me they’ve worked every time. Grease a shallow tin approximately 25cm x 35cm. Melt the butter in a large, heavy-based pan (as tall as you have) over a low heat. Add the sugar, salt and milk and stir until the sugar has dissolved. Bring to the boil and simmer over a fairly high heat for eight minutes. Add the condensed milk, stir well, then turn the heat down and let it simmer for about another 15 minutes, stirring occasionally. Start testing at this point: once it reaches 115C, it’s done. (Alternatively, dribble some of the mixture on to a cold saucer. Leave for a couple of minutes, then push it with your finger; if it sets, it’s done.) 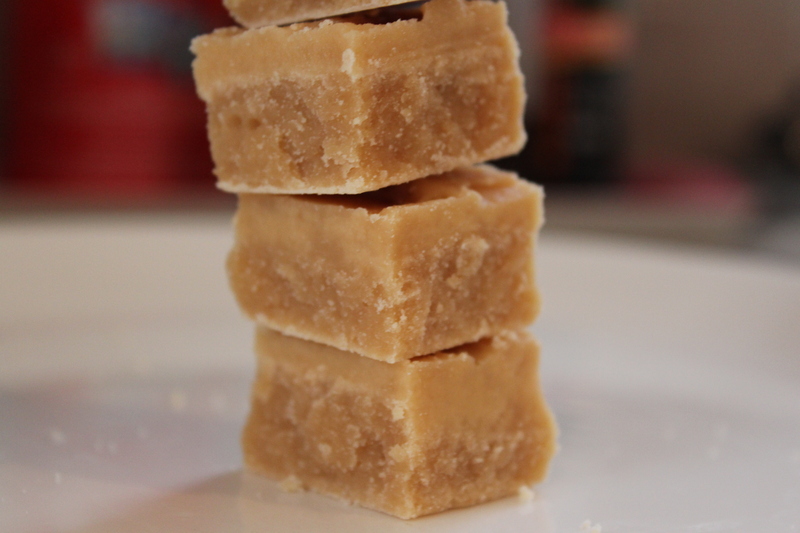 I’ve tried both methods, and I’ve definitely made better fudge using a thermometer. Take off the heat, add any flavourings, if using, and beat vigorously with a wooden spoon or electric beaters until thickened but still pourable (about 10 minutes if done manually, less with beaters). Pour into the prepared tin and leave to set, scoring squares after about 20 minutes. It is best left out to dry slightly overnight.